Isabelle Huppert and Chloë Grace Moretz play a dangerous game of cat and mouse in Greta, a campy thriller with a pair of memorable performances that is critically compromised by a cliche-ridden screenplay. Cut from the same cloth as 90s stalker movies like Single White Female and The Hand That Rocks The Cradle, the film cycles through conventions of the sub-genre with relative ease but does so without making much of an impression on its own terms. Irish director Neil Jordan, probably still best known for his Oscar-winning The Crying Game, is able to generate some suspenseful scenes in the third act, even if it takes a little too long to get there. Moretz stars as Frances, a young waitress living in New York with her street-smart friend Erica (Maika Monroe), who finds a deserted purse on the subway one evening after her shift. Wanting to do the right thing, she follows the address on the driver’s license inside and subsequently meets the titular character played by Huppert, a widowed piano teacher who seems plagued by loneliness. The two soon become close but after Frances finds evidence that suggests their initial meeting might not have been as serendipitous as it seemed, Greta becomes obsessed with preserving what she views as their mother-daughter relationship. It’s vital for a movie like this to have a central character with whom we can empathize as she goes through an increasingly alarming scenario and thankfully, Greta undoubtedly excels in this area. Moretz does a fine job at imbuing Frances with grace and likability right off the bat, while Monroe also continues a nice string of work as a more cynical and savvy counterpart to the naive Frances. But as you may expect, it’s Huppert as the unassuming but deranged Greta who steals the show as she tiptoes and terrorizes her way through a story that isn’t quite deserving of her abundant talents. 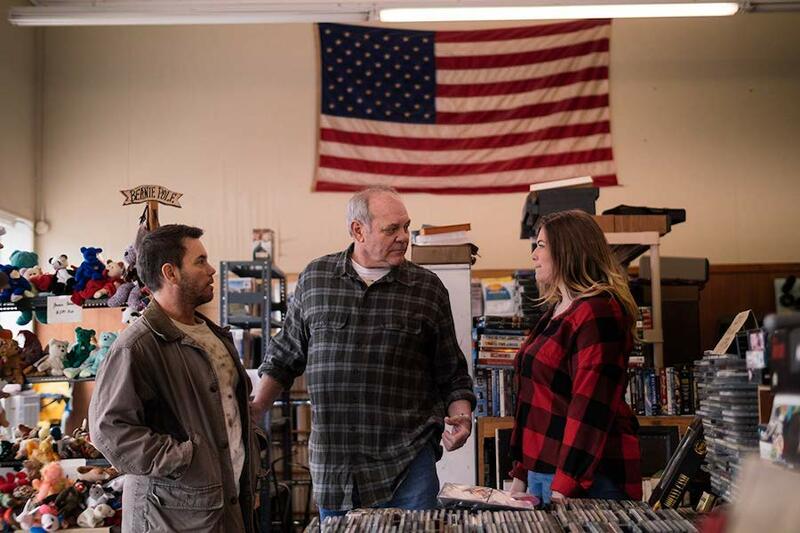 The script, co-written by Jordan with Ray Wright, does not feel as fresh as it should for a film of this genre and creates moments that inspire dubious questions in the minds of audience members. For example, if one was alerted to being watched in a crowded public area, why would he or she leave that area to walk alone down a dark alley? Also, if a kidnapper restrained her captive in a bed, why would she place the bed post up against a wall so that visitors could hear the commotion from said bed post? It’s a shame that the plot folds under basic scrutiny from common sense questions like these because a little fine tuning could have eliminated these errors. Aside from the reckless plotting and glaring issues with many of the decisions made by the characters, there are small delights from a technical aspect that piqued my interest at various points. I appreciated the way Javier Navarrete interpolated the familiar tune of Lizst’s “Liebestraum,” which is played by Greta during her first meeting with Frances, into his tense musical score. Jordan also captures a side of New York that feels more isolated and lonesome than the bustling metropolis we typically see on-screen. Unfortunately, touches like these are simply grace notes to a melody that feels all too familiar and make Greta a fluffy and forgettable thriller. Captain Marvel, starring Brie Larson and Samuel L. Jackson, is the latest Marvel movie about an Air Force pilot who gets caught in an intergalactic conflict between two alien worlds. Arctic, starring Mads Mikkelsen, tells the harrowing story of a man stranded in the Arctic after an airplane crash who must decide whether to remain in his makeshift camp or to embark on a deadly trek through the unknown. Opening at Cinema Center is Song Of Back And Neck, starring The Office’s Paul Lieberstein and Rosemarie DeWitt, in which a man with chronic muscle pain begins to find relief when new romance enters his life. 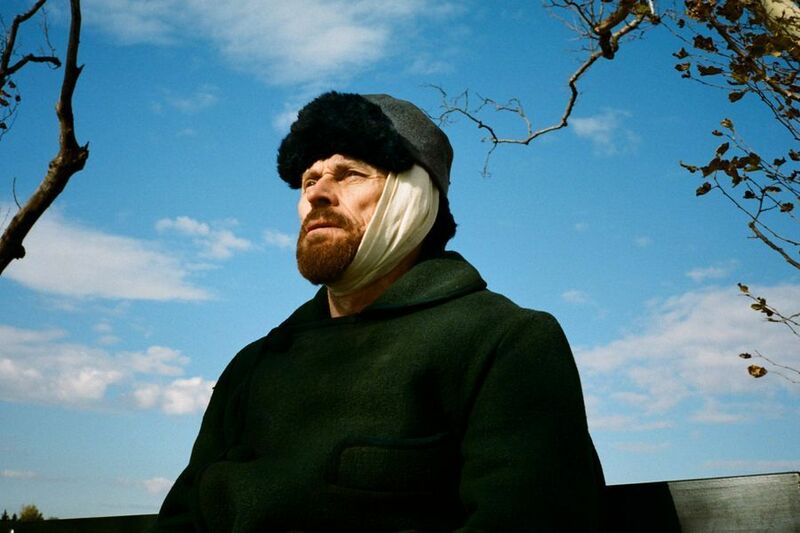 Iconic Dutch painter Vincent Van Gogh has been the subject of several biopics over the years but none have captured his unique artistry more vividly than the excellent new film At Eternity’s Gate. The Diving Bell and the Butterfly director Julian Schnabel has rendered a portrait of the troubled visionary that is appropriately impressionistic and experimental in ways that Van Gogh himself may well have appreciated. Filled with vibrant landscapes and illuminating dialogue, this is a film that constantly searches for beauty and purity as it investigates the final years of a man who took a similar approach to crafting his own masterworks. Willem Dafoe lends a committed and impassioned performance as the tormented artist, to whom we’re introduced in 1880s Paris where his impact in the local art community is almost nonexistent. On the suggestion of his pontifical peer Paul Gauguin (Oscar Isaac), Van Gogh relocates to the rural town of Arles in the south of France, thanks to the financial support of his benevolent brother Theo (Rupert Friend). There, Vincent rediscovers the natural landscape and is inspired to create some of his most remarkable paintings but the insurmountable loneliness inevitably takes its toll as his inner demons threaten to get the best of him. The most bold artistic choices from At Eternity’s Gate come courtesy of cinematographer Benoît Delhomme, who uses unconventional angles and point-of-view shots to share Van Gogh’s perspective with the audience. This unorthodox style may frustrate those looking for a more standard biopic but for me, the use of subjective camera to get inside the headspace of Van Gogh was both engrossing and enlightening. For example, a trip to an art museum, during which Van Gogh confesses in voiceover his reverence for his contemporaries as he gazes upon their works, is shot exclusively from low angles to illustrate how daunted he feels by his peers. Portraying such a towering figure in the art history is an unenviable task and despite the age difference between Dafoe and the real-life subject, he crafts a performance that is effortlessly engaging from start to finish. Even though the actor’s portrayals of rage on-screen would seem compatible for an artist prone to fits of madness, Dafoe does an excellent job of sublimating outward anger into a more nuanced form of melancholy that unquestionably inspires empathy from the audience. At Eternity’s Gate is sensitive and exquisite depiction of a troubled master that is made both by artists and for artists. A Madea Family Funeral, starring Tyler Perry and Cassi Davis, is the 11th and reportedly final entry in the popular Madea film series about a Georgia funeral that erupts into chaos as family secrets come to light. Greta, starring Isabelle Huppert and Chloë Grace Moretz, tells the story of a young woman who becomes intertwined with an eccentric French piano teacher after a chance encounter. Opening for a limited IMAX engagement is Apollo 11, the documentary that scored rave reviews at Sundance last month which documents the 1969 space mission that landed man on the moon. Dreamworks closes out an impressively consistent trilogy with How to Train Your Dragon: The Hidden World, another stunningly animated adventure that serves as a fitting conclusion for fans of the series. While the story is a bit more conventional than those of the previous two films, this entry still has all of the elements that made its predecessors successful and adds notes of finality that distinguish it from the rest. Dean DeBlois has returned as the sole writer and director and his commitment to spearheading these projects has resulted in a trio of films that has bypassed the dips in quality that accompany even the most well regarded trilogies. We return to the Viking village of Berk as the efforts of Hiccup (Jay Baruchel) and his pet dragon Toothless to rescue captured dragons has resulted in their town becoming increasingly overpopulated. As Berk’s head chief, Hiccup makes it his mission to seek out the fabled “Hidden World,” a far away land that could serve as a safe haven for their fire-breathing compatriots. During his journey, Hiccup encounters the treacherous and cunning dragon hunter Grimmel the Grisly (F. Murray Abraham) as well as a brightly colored dragon nicknamed “Light Fury,” with whom Toothless becomes hopelessly infatuated. The How To Train Your Dragon series has stood apart from its animated peers mainly due to the quality of its visual sensibility and The Hidden World is no exception to this. The film’s opening, in which Hiccup and his friends ambush a dragon raider’s cove, gets things off to a dazzling start as fire and fog battle in the background while swords clash in the foreground. The growing number of dragons on-screen also allows for creature design that grows richer the more time we spend in this world. But the high point is undoubtedly our first glances of the Hidden World, a bright and vivid landscape that calls back to the groundbreaking CG work of Avatar in the best ways possible. As stunning as the animation is, the storytelling this time around is not quite up to the standard set by the previous two entries. Despite some deliciously devious voice work from Abraham, it’s difficult to disguise the fact that the villain and his motivations are hardly dissimilar from those of the previous film’s antagonist. 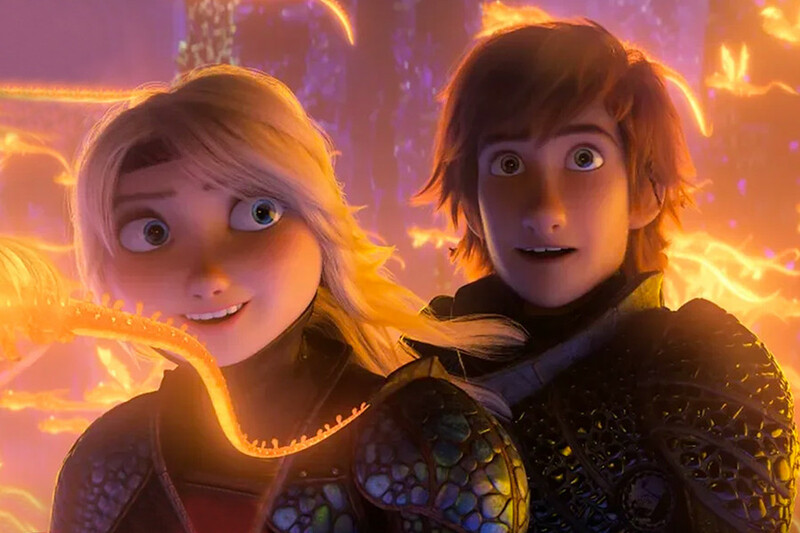 Still, the introduction of romantic subplots for both Hiccup and Toothless create opportunities to take the story in both humorous and heartfelt directions. Toothless’ efforts to impress Light Fury with a mating dance result in the film’s biggest laughs while their synchronized movements across the night sky recall the affectionate space dance from Pixar’s WALL-E. Returning to contribute music to the film, composer John Powell brings back some of the series’ most memorable musical motifs while adding new themes that augment the emotion underneath each of their accompanying scenes. The film also has sonic delights in its accomplished sound design as well, which brings to life the flapping of dozens of dragons’ wings as they maneuver through the air. As a satisfying ending to a family-friendly entertainment that has always had its sights set higher, How To Train Your Dragon: The Hidden World passes with flying colors. Fighting with My Family, starring Dwayne “The Rock” Johnson and Florence Pugh, tells the real life story of professional wrestler Paige as she rises up the ranks of World Wrestling Entertainment. Run The Race, starring Mykelti Williamson and Frances Fisher, is a faith-based feature co-produced by Tim Tebow about two brothers who overcome hardship both on and off the football field. Opening at Cinema Center is Academy Award nominee Cold War, a historical period drama from Poland about a musical director who discovers and subsequently falls in love with a young singer. 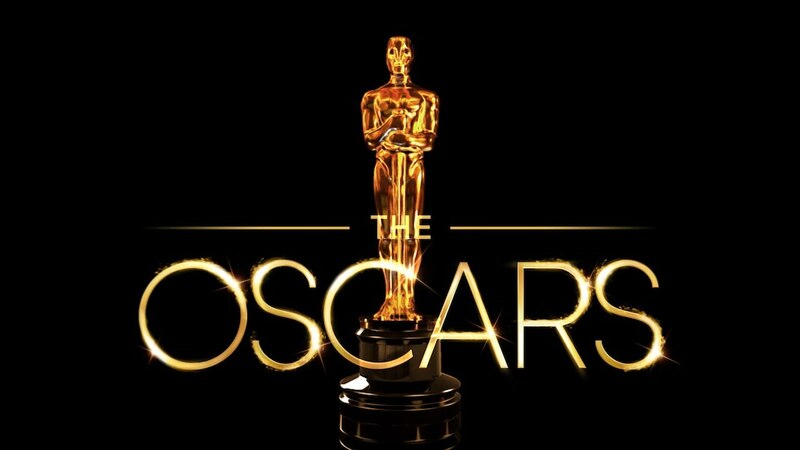 I’m joined by my wife Aubree as we talk over this year’s Academy Awards, including the numerous controversies surrounding the ceremony. Then we’ll go over the nominations in each of the 24 categories with predictions, our personal picks and some overlooked options from 2018. Screening this weekend only at Cinema Center, the new drama Palace is the remarkable feature debut from Taylor University graduate Andrew Paul Davis about the strength of communal bonds among turbulent times. Shot entirely in Indiana (Grant County, specifically) with a $10,000 budget, the film has a clean and professional look that maintains a grounded aesthetic while also finding the unexpected beauty in its surroundings. With a tapestry of richly realized characters, Davis creates an authentic and vivid portrait of Hoosier life that is rarely seen clearly in either independent or mainstream cinema. The narrative circulates around numerous locals with whom we spend varying amounts of time but the story predominantly centers around three central figures. We first meet Chris (Todd Bruno), an aimless auto mechanic trying to overcome the hang-ups of everyday life by creating a political movement within his community. Then we spend time with Chuck (Joe Martyn Ricke), a lonely retiree who drowns the sorrow of insurmountable medical bills with nightly beer pitchers at his local bar. We’re also introduced to Alexa (Emily Sweet), a music education major at a local college who has trouble finding an audience for her up-and-coming hip-hop trio. What I appreciated most about Palace is the way that Davis uses his ensemble cast to place characters in settings where we may only see them once but the possibility of seeing them again is always in play. For instance, we first meet a character who is rude to Chris at his job but when that same character is the only person to attend Chris’ political meeting, their relationship is completely recontextualized. Much like the work of Terrence Malick, Davis lets the trajectory of the story ebb and flow with the feelings and mood of the characters, which can take things into territory that is darker at times and more light-hearted in others. The screenplay, also written by Davis, investigates the ways that all of these characters with differing backgrounds and circumstances are trying, often desperately, to form connections with one another. Whether it’s Chris posting videos online trying to convey his political affiliations or Chuck sitting down with a table of strangers in a bar to start conversation, there is an inescapable loneliness that permeates most of the film. Amid this heartbreak, however, there are notes of humor that balance the tone, as can be found in the back-and-forth banter between Chris and his co-worker as they shoot a game of HORSE during sunset. The use of music, both diegetic and non-diegetic, is varied in terms of the genres that it invokes but this mixture allows for different insights into whichever character is in focus at the moment. Though their musical performance styles couldn’t be more different, both Chuck and Alexa have found comfort in expressing themselves through their music and their passion gives the film an extra layer of soulfulness. With plenty of heart and compassion at its core, Palace is a bittersweet love letter to rural Indiana from a promising young filmmaker who will no doubt have a prolific career ahead of him. Alita: Battle Angel, starring Rosa Salazar and Christoph Waltz, is the latest special effects spectacle from Spy Kids director Robert Rodriguez about a scientist who brings a human cyborg hybrid to life. Isn’t It Romantic, starring Rebel Wilson and Liam Hemsworth, follows a young woman who is hit in the head and wakes up in a world that mimics the tropes of a PG-13 rated romantic comedy. Happy Death Day 2U, starring Jessica Rothe and Israel Broussard, revisits the Groundhog Day-esque slasher in which a young girl keeps reliving the same day repeatedly after being killed by a masked assailant. When The Lego Movie was released in 2014, it was an overwhelming success with both audiences and critics which used the popular toy line as a jumping off point to tell an amusing and visually inventive story. 5 years and 2 spin-offs later, a direct sequel is now upon us but unfortunately, The Lego Movie 2: The Second Part does not recapture the lightning-in-a-bottle success of its predecessor. Despite investigating childlike concepts of creativity and playtime, the first film felt relatively mature in its ideas and execution. While there’s nothing inherently wrong with the sequel’s attempt to cater more to younger audiences, it’s a creative decision that undoubtedly weakens the film’s comedic thrust. Set 5 years after our hero Emmet Brickowski (Chris Pratt) saves Bricksburg from the evil Lord Business (Will Ferrell), the Duplo invaders have since turned their idyllic city into a post-apocalyptic wasteland renamed Apocalypseburg. A new alien threat emerges as General Sweet Mayhem (Stephanie Beatriz) kidnaps Emmet’s girlfriend Lucy (Elizabeth Banks) along with other citizens of their town and takes them far away to the Systar System. 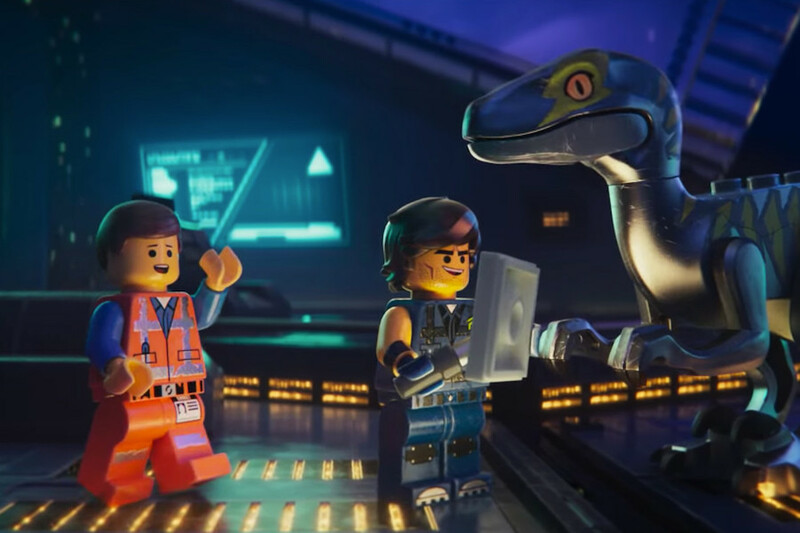 After Emmet crosses paths with intergalactic hero Rex Dangervest (also voiced by Pratt) and his crew of talking velociraptors, they launch a rescue mission to recover their friends from the shape-shifting Queen Watevra Wa-Nabi (Tiffany Haddish). The Lego Movie‘s directing duo of Phil Lord and Christopher Miller have returned to write this follow-up but in the director’s chair this time around is Mike Mitchell, who helmed the Dreamworks hit Trolls a few years back. This change might seem inconsequential but the impact is evident, as the overbearingly bright color palette and more juvenile tone of that film seems to be on full display for The Lego Movie 2. The story is generally one-dimensional until the third act, during which its message about altruism amid trying circumstances is laid on so thick that I felt like I was getting sprayed with a pathos fire hose. With their work on the Cloudy with a Chance of Meatballs and Jump Street films, Lord and Miller have established their own brand of meta humor that pokes fun at the tropes of their respective franchises. They use the same approach with the screenplay this time around, as when Rex Dangervest unveils his heroic tools like the CPD (Convenient Plot Device) and the Implausitron. While they do occasionally land some nice one-liners in the process, the jokes on a whole just don’t seem as fresh as in Lord and Miller’s previous work. Perhaps I’ve grown a bit weary of self-aware humor as of late but it’s also possible that the writing duo just didn’t put quite as much effort in this time around. The film also relies more heavily on pop music and musical numbers to keep the energy high but nothing quite matches the infectious exuberance of The Lego Movie‘s “Everything Is Awesome.” There is an attempt to recreate the first film’s earworm in the appropriately titled “Catchy Song” but its claim that “this song is gonna get stuck inside your head” feels like more a threat than an invitation. Beck and the comedy trio The Lonely Island fare better on an end credits song that may be the film’s peak in terms of comedic innovation. Sadly, it’s a reminder of the lost opportunities that precede it which make The Lego Movie 2: The Second Part a mild disappointment. Cold Pursuit, starring Liam Neeson and Laura Dern, tells the tale of a vengeful snowplow driver up against a drug cartel after his son is murdered in their Rocky Mountains hometown. The Prodigy, starring Taylor Schilling and Jackson Robert Scott, centers around a mother who begins to suspect that her brilliant young son may be possessed by supernatural forces. What Men Want, starring Taraji P. Henson and Tracy Morgan, is a gender-swapped remake of the Mel Gibson film What Women Want that follows a woman who is able to hear men’s inner thoughts. 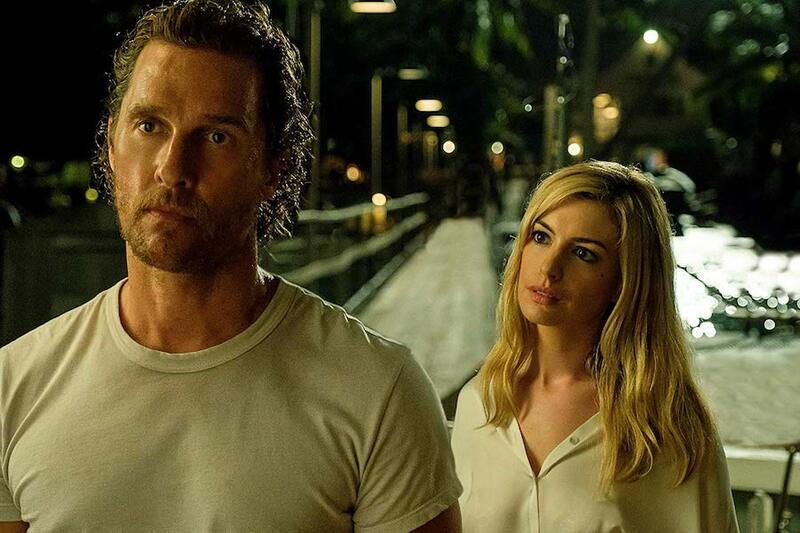 Academy Award winners Matthew McConaughey and Anne Hathaway team up once again after 2014’s Interstellar to bring us Serenity, a spectacularly miscalculated neo-noir that has “so bad it’s good” written all over it. Director Steven Knight’s previous film Locke was a stripped down feature that was essentially a one-man show for a confined Tom Hardy. Knight’s latest effort seems to take the complete opposite approach, merging story elements that have no business being anywhere near one another. “There’s some weird stuff going on right now,” McConaughey growls at one point while fixing his eyes on a bird above and the truth is, he doesn’t even know the half of it. McConaughey stars as Baker Dill, a gruff fisherman who has made it his sole purpose in life to catch an oversized tuna that he’s nicknamed “Justice,” much to the chagrin of his first mate Duke (Djimon Hounsou). He passes the time consorting with townspeople of Plymouth Island like the well-off Constance (Diane Lane) until his ex-wife Karen (Anne Hathaway) comes back into the picture with a provocative proposal. She offers Dill $10 million in cash to take her abusive husband Frank (Jason Clarke) out to sea so that he can get him drunk and throw him overboard to spare her and Dill’s son from his violence. At the outset, the premise seems to be a halfway decent hybrid of classic film noirs like Double Indemnity or To Have And Have Not and man vs. nature tales like Jaws or The Old Man and the Sea. That Serenity can’t find a harmonious balance between these two discordant genres is actually the least of its worries, as the truly outlandish third act reveals belong to an entirely different category of film altogether. Knight’s clunky attempts to foreshadow the most surprising revelations of the film’s conclusion are just as inelegant as the explanations themselves. It’s proof that the kind of twist endings that made M. Night Shyamalan famous may not be as easy to pull off as one might think. Even before the preposterous turns that kick in around the hour mark of the film’s runtime, the needlessly profane script is loaded with dialogue so hollow that it would float in the water if it was tossed overboard. Knight’s direction is equally incompetent as he chooses to fixate on unusual imagery that never fully justifies its existence, as when we see a mysterious man played by Jeremy Strong in a full suit wading through water. To the film’s credit, it’s rarely unpleasant to look at due to Jess Hall’s exotic cinematography, although it is sometimes undercut by bizarre editing choices that seem far too stylized for the story that’s being told. Just because the performances are not quite as bad as everything else that’s at play here doesn’t mean the actors should entirely be let off the hook. McConaughey is channeling the same one-note brooding demeanor that he uses for his Lincoln car commercials, while Hathaway adds little dimension to the same kind of femme fatale character we’ve seen played better in countless other films. Clarke and Strong both overact so wildly in their scenes that it became increasingly difficult for me to stifle my laughter anytime either of them was on-screen. Watching Serenity is like watching a catastrophic shipwreck occur in slow motion. Miss Bala, starring Gina Rodriguez and Anthony Mackie, is an action thriller that follows a makeup artist who trains to take down a drug cartel after they kidnap her best friend. Playing at Regal Coldwater for one day only on Friday, Febuary 1st is They Shall Not Grow Old, a documentary from Peter Jackson comprised of World War I footage that has been colorized and modernized. Another limited engagement screening happening at Cinema Center on Thursday, February 7 is Joni 75, a concert film celebrating the life and prolific career of singer-songwriter Joni Mitchell. Sadly, this year’s batch of nominees is somewhat underwhelming. The Academy is still waffling between how many nominees should be in the category; there were 9 the past 2 years but now we only have 8. What’s wrong with just having 10 and calling it done, especially when First Man and If Beale Street Could Talk would’ve rounded things out nicely? The good news is that Roma is the current expected winner and while it’s not my personal favo(u)rite of the bunch, it’s an exceptionally well-made film that represents the category nicely. An interesting bunch here, especially with the inclusion of Pawlikowski and the exclusion of Bradley Cooper for A Star Is Born. Somehow, this is the first time that Spike Lee has been nominated for Best Director (Do the Right Thing lost Best Original Screenplay in 1990). It is truly stunning that McKay received a nomination in lieu of plenty of other more worthy directors like Barry Jenkins and Damien Chazelle. The chances are miniscule that Alfonso Cuarón, who won Best Director in 2015 for Gravity, will lose here. I haven’t caught up with At Eternity’s Gate (I’ll give Dafoe the benefit of the doubt) but I just can’t get excited about this field. Two of the nominees rely heavily on hair and makeup to augment their performances and I’d consider them both to be the frontrunners at this point. Elsewhere, Mortensen does what he can with a heavily stereotyped role and while Cooper is probably my favorite of this group, it’s not terribly high praise. Ethan Hawke is a glaring snub but Ryan Gosling, Joaquin Phoenix and Brady Jandreau (since the Academy seems friendly to newcomers this year) would have been much better picks too. Update: I have now seen At Eternity’s Gate and will say that Dafoe has my vote for his committed performance as Vincent Van Gogh. I have also switched my prediction from Christian Bale to Rami Malek, who has emerged as the front runner since my original post. I haven’t caught up with The Wife yet (I may do so before the ceremonies) but I can say that I feel much better about this category in comparison to Best Actor. Great to see a first-time actress like Aparicio get a chance here but I also would have loved recognition for Elsie Fisher (Eighth Grade) and Thomasin McKenzie (Leave No Trace) as well. It’s bizarre for me to see McCarthy here, since the wounds of The Happytime Murders still feel fresh. 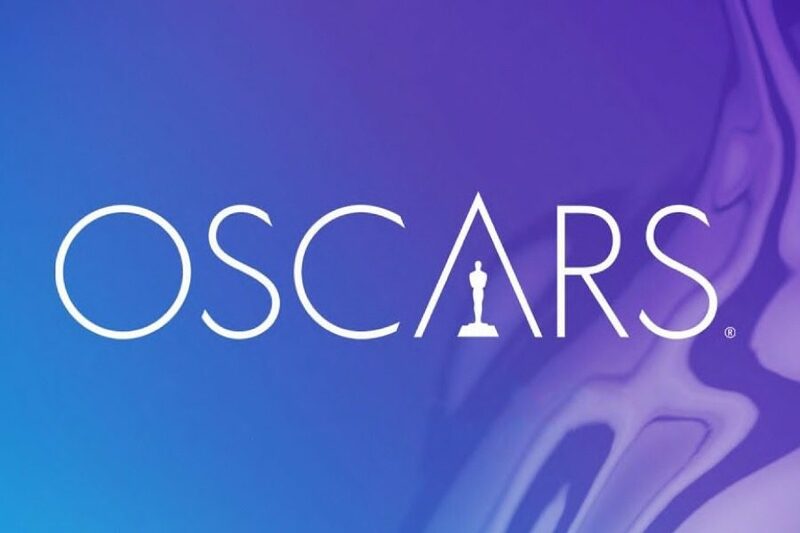 Close, nominated six times previously without a win, will likely take home the “Overdue Oscar” although Lady Gaga makes for an intriguing upset pick. The supporting categories this year call to mind how desperately the Academy needs to implement a Best Ensemble category. Regina King was wonderful in If Beale Street Could Talk but that film had at least 4 or 5 other supporting performances (some which only occur during one scene) that are at least as good if not better. Stone and Weisz will likely cancel each other out, a shame since their performances tower over the other three picks. I’m no fan of Vice but Steve Carell would have been a better pick than Sam Rockwell, who already won Supporting Actor last year anyway and had a much easier role in the film. Overlooked: Won’t You Be My Neighbor? M. Night Shyamalan fully embraces the superhero genre with Glass, a sequel to 2000’s Unbreakable and 2017’s Split that gleefully brings the comic book lore of its predecessors to the forefront. Indeed, nuance and subtext are not among this film’s strongest qualities but as an earnest, all-out depiction of what superpowers might look like in the real world, it succeeds more often than it doesn’t. Working with a relatively modest $20 million budget (a tenth of what Marvel typically spends on such fare), Shyamalan wisely keeps the action and settings small-scale to thoroughly investigate what makes these superhuman characters tick. Bruce Willis reprises his Unbreakable role as David Dunn, a security guard who has since become a vigilante hero named The Overseer since discovering his superpowers. He inevitably crosses paths with Kevin Crumb (James McAvoy), the kidnapper from Split with multiple personalities who is able to conjure a powerful alter named The Beast. After the two are caught post-showdown, they are brought to a mental hospital where Dr. Ellie Staple (Sarah Paulson) is determined to convince them, as well as Dunn’s previous foe Mr. Glass (Samuel L. Jackson), that they are just ordinary people who have delusions of grandeur. In a world where blockbuster comic book movies seem to come out every month, Glass serves as a nice counterpoint to the largely homogeneous product that tends to populate the market these days. Despite falling victim to uneven pacing and distractingly on-the-nose dialogue, the film has a heart and personal vision behind it that feels absent from even the best of Hollywood’s superhero offerings. Like last month’s Spider-Man: Into the Spider-Verse, it also has a reverence for comic book culture that has seemingly been lost during the film industry’s commoditization of the superhero genre. Shyamalan’s script sometimes strains too hard when making connections to the other two films in the Eastrail Trilogy but in more ways than one, Glass often feels like a worthy conclusion to the grand narrative. It’s difficult to imagine Shyamalan had this film in mind when he was making Unbreakable 20 years ago and even though the two are still tonally incongruous, their connective tissue now feels undeniable. Shyamalan’s smartest storytelling decision here is his inclusion of secondary human characters from previous films, whose ties to their respective superhuman characters make for naturally high stakes that keep us invested in the story. The performances from the ensemble cast, which also includes Split‘s Anya Taylor-Joy and Unbreakable‘s Spencer Treat Clark, make this mini-universe of heroes and villains that much more believable. Jackson and Willis do a terrific job of resurrecting characters that have laid dormant for quite some time while McAvoy brings an extra level of dedication to an already challenging role by seamlessly switching between disparate personalities at the drop of a hat. Glass may have mixed results with the cult following that has surrounded Unbreakable but those looking for a change-up to the typical comic book formula could be pleasantly surprised. The Kid Who Would be King, starring Ashbourne Serkis and Patrick Stewart, follows a young boy who sets out on a medieval quest after he discovers King Arthur’s famous Excalibur sword. Serenity, starring Matthew McConaughey and Anne Hathaway, is a neo-noir thriller in which a fishing captain is approached by his ex-wife to murder her new husband. Stan & Ollie, starring Steve Coogan and John C. Reilly, depicts the later years of the comedy duo Laurel and Hardy as they commit to an expansive theatre tour in Britain as an attempt to revive their film careers.